The hit Lifetime series, Dance Moms introduced us to young dancers and their tutor, Abby Lee Miller. The show chronicles the training of children in dance and show business, as well as the interactions of the instructor and the dancers with their mothers, all of whom make up the Dance Moms cast. The mothers’ hope is to make their prepubescent daughters famous. The aim of the show seems to be well achieved as a good number of the dancers have become bonafide celebrities, sought-after dancers, models, and internet sensations. Though it airs on a platform which is not normally your go-to network for reality programs and was not expected to run beyond a few series, it became a sensation with high ratings and a number of awards. It also spawned some spin-offs and inspired the formation of some other groups as well. We watched these young girls grow up on our screens and improve on their skills over the years. However, most of them left the show with their mothers in the seventh season to form The Irreplaceables and others followed Abby, to do entirely different things. Therefore, it has become a question of where are they now and what are they doing? Abby Lee Miller is the owner and chief choreographer of Abby Lee Dance Company (ALDC) and the director of Reign Dance Productions as well. During her time on the show, she tried to bring out the best in her students although some of the techniques she employed were considered extreme and inappropriate for the young girls. She was, therefore, under fire for her style. Her career was mired with financial related crimes for which she was sentenced leading to her leaving the show in the second half of season 7. However, the tireless and passionate dance instructor announced her return to the show in season 8 on July 11, 2018. Gianna Martello is an assistant choreographer for the ALDC where her talent and magnetic personality were hard to miss. She is also prominent for the stunning choreographies she invented for the show through the 7 seasons she was with the team. The American dancer, model, and TV host came in to replace Abby when most people thought the show has gotten to its end. She is prominent for her time on the ABC’s Dancing With The Stars where she has participated for 21 seasons. Burke got engaged to Matt Lawrence in May 2018. These two sisters were original cast members of the show and started dancing under Miller at ages 4 and 2 respectively. Maddie was clearly born to dance and easily took up the focal point of the show. She also occupied the much-coveted spot of Abby’s favorite student, leading to tensions within the group. She, however, managed to hold on to her pedestal. While she became a lyrical/tap dancer her sister, Mackenzie Ziegler, held her own end as an acro/hip-hop dancer and singer. Also, during her time on the show, she developed a close relationship with the Chandelier singer, Sia after featuring in her music video and has since appeared in two other videos, Unstoppable and Elastic Heart as well as has toured with the Australian singer. After six seasons on the show, the Ziegler sisters were ready to call it quits. Maddie transitioned into the real Hollywood industry as a dancer and actress She is also firmly establishing her feet in the entertainment industry and is proving on different platforms that she has come to stay. Her memoir titled The Maddie Diaries became a New York Times Best Seller. Moreover, she appears in ad campaigns, magazine covers and has been signed by IMG which is a major move in her career. Mackenzie, like her older sister, also wrote her own memoir, titled Kenzie’s Rules for Life: How to Be Happy, Healthy, and Dance to Your Own Beat. She has also pursued a music career under the stage name, Mack Z and has gone a step further to design a clothing line with JUSTICE. Chloe Lukasiak was also an original cast of the show and began her dance tutorials in ALDC as early as when she was 2. She has evolved into a ballet, lyrical/contemporary dancer and also has professional touches in other forms of dance such as acro, jazz, tap, hip-hop. Despite being a founding member of the group, she ditched the show after season 4 citing some serious health issues. She now dances at Studio 19 but made a guest appearance in Season 7 on the show prior to joining The Irreplaceables for their dance tours. Chloe’s fast becoming a Hollywood A-lister, maybe not at the Maddie level. She has appeared on magazines covers, attended multiple red-carpet events, is an Instagram star (with almost 6 million followers) and also has a book club, Chloe’s Book Club at Barnes and Noble. The Hyland’s is another pair of siblings that took the shot at fame with the Dance Moms. The older one, Brooke is an acro dancer and singer while her baby sister, Paige Hyland is a jazz dance. Their mom, Kelly was a student at ALDC as a teenager before quitting to be a cheerleader. The duo, however, left the show amidst season 4 which could be a fallout of their mom assaulting Abby and focused on their studies. The sisters may have hung up their dancing shoes and are now exploring their other interests. Brooke Hyland is currently a junior at Ohio University where she is studying business and makes out time for some sponsored contents on her 3 million followers Instagram account. Paige is now a model and has modeled at New York Fashion Week. While the other Dance Moms cast grew up on the show and subsequently rose to fame therein, Kelani Hilliker was not an original cast member. She joined the others in the fourth season after contesting on season 2 of Abby’s Ultimate Dance Competition with her mother, Kira. She became a regular cast member until season 7 and is a founding member of The Irreplaceables. Hilliker is a lyrical dancer, model, actress, and fashion designer, turning her love for clothes into a business. She launched a dancewear line called Kalani Collection with Purple Pixies, a clothing label, Mod Angel, and a premium sock line called KH by Kalani. This young dancer connects with dancing in all its forms and says it would always reflect in whatever she does. Though she was an underdog during her time on the show and was the last original cast member to break her contract. Right now, she has moved on to new accomplishments as she seeks to carve a niche for herself as an entertainer. Besides dancing, Nia Frazer acts, sings (Nia Sioux), has a YouTube channel with over 500k subscribers, and has also launched her own website, Nia Sioux Frazier, where she shares her thoughts and insights. Kendall Vertes is still dancing and is a member of the deviant group, The Irreplaceables. She is also a model and an aspiring singer with the stage name, Kendall K. In 2015, her music video for Wear ‘Em Out which beat Taylor Swift’s Bad Blood on iTunes. Moreover, her Christmas album which she released in 2017 was streamed for 55 hours straight. Vivi-Anne’s mother, Cathy is the owner of one of ALDC’s rival groups, Candy Apples Dance Centre where she previously trained. However, Vivi-Anne joined the Dance Moms cast for most of season 1 but appeared occasionally from season 2. She left the show with the others but still dances in her mother’s studio. Asia Monet Ray was the youngest contestant on the Abby Ultimate Dancing Competition for the two seasons, danced with the Junior Elite Competition Team in Season 3 but left just before the nationals. Following her dancing career, she got her own breakout show on Lifetime channel titled Raising Asia as well as her own YouTube channel. She is also an aspiring singer under the moniker Asia Monet as well as an actress. Brynn Rumfallo joined the team as a guest dancer in season 5 but became a full-time member in the first episode of the 6th season. Dance Moms wasn’t her first shot at dancing; she had previously trained at Club Dance Studio, Arizona. Along with the other remaining ALDC members, she left the show in season 7. She has not disappeared from the limelight but took the path of fashion and acting. Brynn also envisages attending college and becoming a surgeon (plastic surgeon) thereafter. 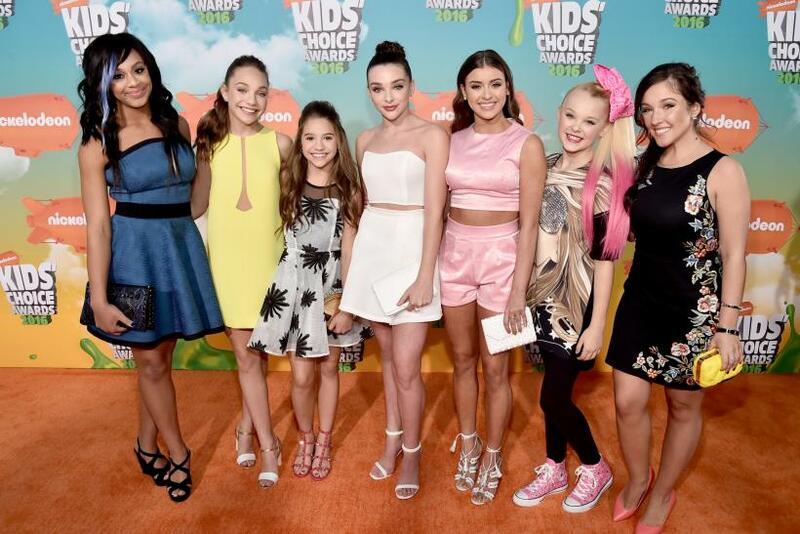 JoJo Siwa was one of the Dance Moms cast who joined the show later. Prior to being a regular, she appeared with her mother, Jessalynn on the second season of AUDC and joined the ALDC as a guest dancer in season 5 though she left in the next season. Since she left the show in 2016, she has become an actress, a businesswoman, and social media sensation. She partners with Claires to create a variety of bright bows as well as products adorned with them. Lilliana Ketchman: Liliana and her mom Stacey Ann Ketchman joined the ALDC in Season 6 with Lilliana making it to the elite team in Season 7. They joined the other remaining ALDC members to make an exit following the season finale. Elliana Walmsley: Walmsley is part of those who joined the group in the later seasons and is one of the youngest in the list. She joined the ALDC and the elite tea in Season 6 and 7 respectively but left with the remaining members thereafter. The dancing prodigy still dances. Camryn Bridges: Bridges became a member in Season 7 but joined those that decamped to form The Irreplaceables. She is 16 now and still does her favorite thing, which is dancing. Maesi Caes: Maesi is a hip-hop & contemporary dancer from Iowa. She joined the team in season 7 but left shortly after. The 13-year-old (b.March 18, 2005) who started dancing when she was 3 is a dancing phenom and real sensation. She has advanced in the world of music, with two Grand National Championships to her name and several other dance competitions victories, as well as an induction into a Hall of Fame at the age of 10. Maesi has also performed on stage with Justin Bieber in 2016 on his Purpose tour. She is pretty young, and of course, has a number of things she’d still love to do like to star in a movie and be a prominent choreographer. To keep up with the prodigy, look for her name in lights. The reality TV show premiered on Lifetime Network on July 13, 2011, and has run for seven seasons with over 200 episodes. It also won the Kids’ Choice Award for Favorite Reality Show in 2015. Despite the show being criticized for verbal attacks on the children by Abby and rival mothers, including attacks on their personal characters, it was considered a huge success and spawned a number of spin-offs as well as a different version and a film based on it being developed by Ellen DeGeneres. The spin-offs include Dance Moms: Miami (2012), AUDC (2012-2013), Abby’s Studio Rescue (2014). The British version, Dance Mums premiered in October 2014 and ran for two seasons. Some of the shows rival dance crews include Candy Apples Dance Center from Ohio, Studio Bleu Dance Center from Virginia, Murrieta Dance Project from California and Broadway Dance Academy from Michigan. Abby Lee Miller was diagnosed with Burkitt lymphoma in April 2018 after her stint in prison. Nonetheless, she hinted on her return to the show for season 8 leaving speculations rife on an actual season 8, cast members and location. The show was set originally in Pennsylvania but relocated to Los Angeles, California and filmed primarily at the ALDC studios. The series is streamed on a number of websites so you can either watch online or download to an offline device. Also, you can catch new and old episodes on the official Dance Moms page on the Lifetime network’s official website, here. The juicy part about watching from the official website is that episodes are available from season one. All you would be required to do is to create an account.